Escape Room Team Building – Does Your Group Have What It Takes? A traditional escape room has a group assemble in a themed room and then they’re tasked with solving clues to “escape” before the time runs out. Beating an escape room requires teamwork, speed, creativity, and communication making them a great activity for friends and family. At Wildly Different, we’ve come up with two different solutions. Our first is a tabletop escape “room” we call “Unlock the Mystery.” Each team is given a locked chest with clues inside that lead them to unlock the giant chest on stage. It’s an interactive yet compact take on escape room team building. So if you are looking for conference room team building activities this one is a perfect fit. Virtual Escape Room Team Building – You Don’t Have To Be In The Same Room! Our second team building escape room, called “Crack the Code,” takes place entirely on an iPad. Teams must search the “room” by clicking on certain items on the game screens and solving puzzles. Their goal is to get out of the room before time runs out! The beauty of this one? Teams can actually play virtually and simultaneously, even if they are all in remote locations. Trying to decide if an escape room team building activity is right for your group? Here are 4 reasons why they’re the perfect team building event! Escape the Cubicle: We often get caught up in our own tasks, working in cubicles or “silos” without thinking of asking for help or offering it. Like escape rooms, an escape team building experience requires players to work together to achieve a common goal: to solve the mystery before the time runs out. To achieve this goal, they must solve a series of puzzles and clues as a team. Everyone must play their part, encouraging teammates to utilize skills like critical thinking, problem solving, communication and teamwork to achieve their goal. Escaping the Norm: Escape team building experiences are easily themed to your company, whether it be a specific scenario or including company-specific clues. Do something unique by incorporating your company’s culture and values! You can drive home your meeting’s theme or your company’s objectives. Are you wanting to give back to the community? Make it a charitable escape experience. 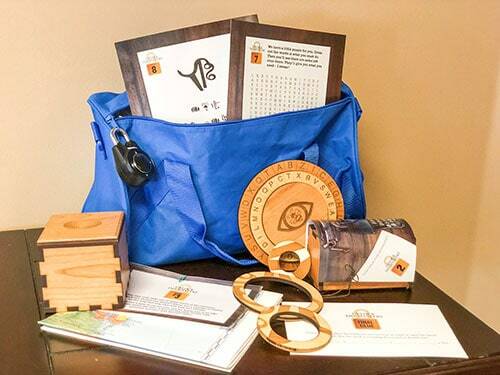 Whatever the guests “solve” or “unlock” can be donated to a charity of your choice. Is your meeting about communication in the workplace? Have clues that focus on communication with other teams. Want to highlight your company’s motto or pledge? Add company-specific content to the game!There are so many ways to make an escape experience your own! 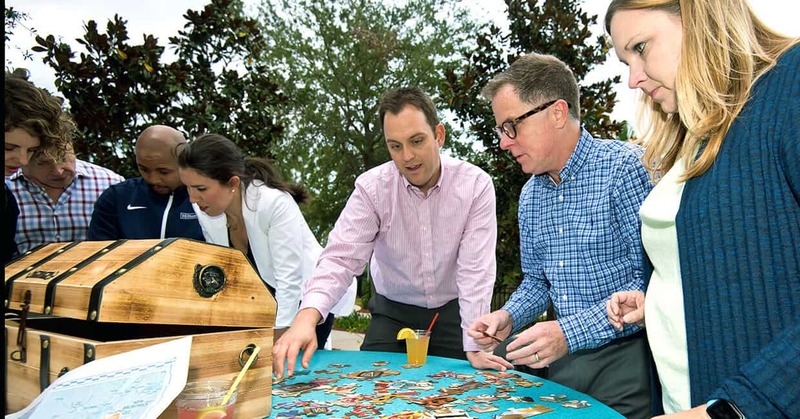 Escape the Office: Tabletop escape experiences can be conducted in almost any event space, whether it be a small meeting space, a large convention center, or a private room at a restaurant or themed event venue. The idea is to limit the activity to tables, allowing teams to stay in one place until it’s time to solve the main mystery. This allows you to host the event almost anywhere! 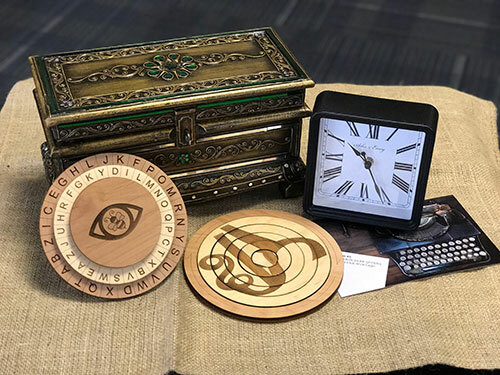 Escape The Ho-Hum: Escape room team building experiences are full of thrilling, nail-biting anticipation as players try to solve the clues before time runs out. There’s epic music playing in the background and a large countdown clock adding to the escape ambiance. Players are eager to not only beat their opposing teams, but beat the clock as well! The excitement makes this event a memorable and fun team building exercise. Stand out by using an escape room team building experience at your next team building retreat!